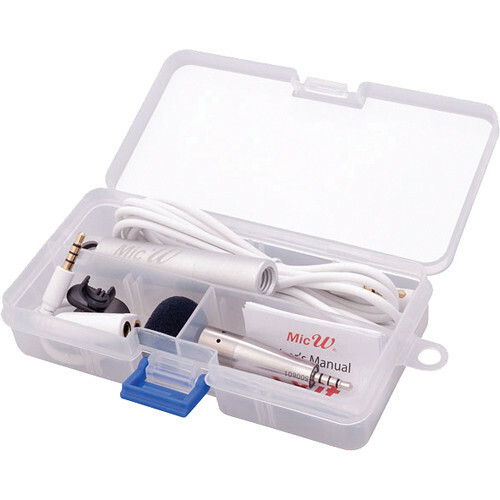 The i266 High Sensitivity Cardioid Microphone Kit from MicW includes the microphone, WS013 windscreen, CL013 clip, CB011 extension cable, CB012 split cable, and the AC011 tube. The i266 is a high sensitivity cardioid microphone for low level signals. It is recommended for dedicated, high quality sound recording. This durable microphone can also be used in conference rooms, or for vocal or live music capture. The WS013 windscreen is a standard foam windscreen for the i266 Microphone. The CL013 clip is a collar or label clip for lavalier purposes and the CB012 is a 3.5mm Y adapter to 3.5mm microphone input and headphone output jacks. The AC011 tube is a microphone carrying case and stand mount. This tube is an aluminum storage case with 3/8” thread, which protects the microphone when not in use and holds it when mounted on a microphone stand. The Windscreen from Mic-W is designed to be attached to a Mic-W i436 or i456 microphone to effectively minimize wind noise during recordings. The Collar Clip from Mic-W is designed to hold Mic-W's i436, i456 or i266 microphone and attach to a shirt collar during audio recordings. The Extension Cable from Mic-W allows you connect your iPhone, iPod touch or iPad to your Mic-W i series microphone. Rather than plugging the microphone directly into the headphone jack, this extension cable gives you the freedom of using the microphone up to 6.6 feet away from your device. The Split Cable from Mic-W is designed to be used with the Mic-W i series microphones. The male connector attaches to the headphone jack of your iPhone, iPod touch or iPad, while the two female ports on the other end allow you to connect the microphone as well as earbuds. The Aluminum Tube from Mic-W can be used as a standalone holder for a Mic-W i series microphone, or can be used with a tripod. The tube is outfitted with a standard 3/8" screw and hole for the microphone. When you're not using the microphone, you can even store it inside of the tube. Box Dimensions (LxWxH) 4.1 x 2.9 x 0.05"
Box Dimensions (LxWxH) 3.4 x 2.0 x 0.03"
Box Dimensions (LxWxH) 7.0 x 3.0 x 1.0"
Box Dimensions (LxWxH) 4.0 x 2.5 x 1.0"
Box Dimensions (LxWxH) 4.1 x 2.1 x 0.05"